Not Westminster but Berlin, where the orchestra is electing a new conductor to follow Sir Simon Rattle for the season starting in September 2016. Or is it? Apparently the members of the BPO can’t decide between the Latvian Andris Nelsons, just about to complete an acclaimed tenure in Birmingham with Parsifal, and Christian Thielemann, presently in charge of the world’s oldest orchestral foundation, the Dresden Staatskapelle (and no mean Parsifal conductor himself). Over at Amati, Jessica Duchen has written a thoughtful analysis of the situation subtitled ‘Where did it all go wrong’, and plenty of observers see the deadlock as the sign of stasis, an organisation in crisis. I’d argue, however, where did it all go right? As it was back at the turn of the millennium before Rattle’s appointment, the orchestra’s soul and identity is being battled over – not by a government, or a tightwad bunch of sponsors with agendas to burn, or even a high-handed board of directors – but by its members. That the orchestra has both a soul and an identity worth arguing over is a good thing in its own right, and so is the internal confidence to say to themselves and to the world, we know who we are, we just haven’t worked out between us what we want to be next. The election may look like a battle (sound familiar?) between conservative (Thielemann) and progressive (Nelsons) forces of leadership, but that summary doesn’t bear over-close examination. The repertoire of neither conductor is especially adventurous – either way there will be an awful lot of Strauss – and their interpretative styles are likewise both in hock to venerable traditions. I’d rather listen to Nelsons’ Beethoven any day, but it isn’t especially period-influenced. It may be that the members of the BPO regard both candidates as plausible from a marketing perspective – Thielemann may have the edge in the all-important far-Eastern market which subsidises much commercial activity in the rest of the classical music world – but neither is seen to offer that long-term reach into the future which such an institution needs in order to survive and evolve and thrive. Some members will doubtless have borne in mind that the election of Thielemann would be a public-relations crash waiting to happen in Anglophone countries. The orchestra’s tours there would likely be dominated not by coverage of the music-making but politically-motivated commentary based on the conductor’s Prussian heritage, autocratic behaviour and reported support for far-Right groups and ideas. Much of this is mud, but some of it sticks. Meanwhile Nelsons is just two years into his first job with one of the world’s Champions League orchestras, the Boston Symphony. 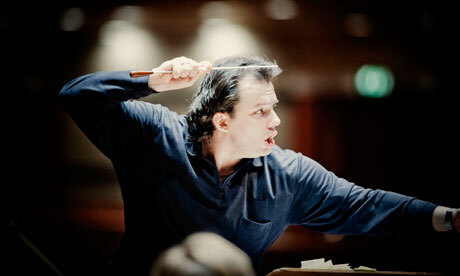 Can he, at the age of 36, supply not only the dynamism but authority required by the Berlin Philharmonic? He isn’t sure himself. Critics in Berlin, London and elsewhere are quick to quibble with Rattle’s individual interpretations but have not always recognised the degree to which he has raised the bar of expectation for what a conductor can and should do in a long-term relationship with an orchestra. Through the use of consensus and intense study, charisma and personal charm he has kept many conflicting elements at play, in productive tension, in the music he conducts and the musicians he works with (the application of these qualities in his own sphere of influence won Tony Blair three terms of office as Prime Minister of the UK). Nearly everyone after him seems somewhat one-dimensional by comparison. So why should the BPO members rush to a decision just to give a headline to the arts pages? If the nation of Belgium can run without a single point of governance for over two years, why not a relatively small group of highly skilled musicians? In five years’ time, both Nelsons and Daniel Harding will be over 40 years old. Even Herbert von Karajan was already 46 when he became music director of the orchestra he said he was ‘born to conduct’. Organisations as small as church parishes and as large as nations find that a period of interregnum can prompt self-reliance and focus on finding a vision for the future that belongs to them and not just their leaders or sponsors. They should take their time. And meanwhile the successful candidate will be all the readier to lead when the phone-call comes: more reliably than politicians, conductors get better with age. Posted on May 12, 2015 May 12, 2015 by Peter Quantrill	This entry was tagged Andris Nelsons, Berlin Philharmonic, Christian Thielemann, Herbert von Karajan, Simon Rattle. Bookmark the permalink.